Lichen Planopilaris is also known as follicular Lichen Planus or Lichen Planus follicularis. It is a variant of Lichen Planus (LP) of the scalp which leads to scarred alopecia followed by permanent hair loss on the scalp. It is an autoimmune disorder. The histological hallmark of Lichen Planopilaris is a chronic per follicular and interface dermatitis that affects the hair follicle infundibulum (the segment that extends from the entrance of the sebaceous gland duct to the follicular orifice) and isthmus (the short segment that extends from the insertion of the erector pili muscle to the entrance of the sebaceous gland duct). This leads to the destruction of basal keratinocytes in the hair follicle. Lichen Planopilaris mainly affects middle-aged people, more common in men. This type of LP exhibits primarily as skin flaking, hair loss and pruritis (severe itching). It is manifested by tiny red spiny papules around a cluster of hairs. Sometimes even blistering occurs in the lesions. In some cases, no follicular scaling or inflammation is present but bald areas of scarring slowly appear. It can be multi-focal or central alopecia patches with follicular hyperkeratosis or hardening and erythema or redness at the hair-bearing margin. Convincing cases of Lichen Planopilaris include a combination of typical Lichen Planus lesions and scarring alopecia. Those cases presenting only as scarring alopecia of scalp require histological co-relation (i.e. biopsy) for exact diagnosis. Research say's that up to 40% of scarred alopecia is due to Lichen Planopilaris. In conventional therapy, the treatment generally comprises of short tapered courses of prednisone in combination therapy with retinoids or anti-malarial drugs. Other options include psoralen-UV-A, systemic and topical steroids, etc but its efficacy for the treatment is not proved. Lichen Planopilaris should be treated as quickly as possible to avoid permanent hair loss. Treatment is case-dependent, as the severity of symptoms, the extent of the lesions and response to treatment vary from individual to individual. If not treated in early stages, it may lead to permanent loss of hair and in such cases, homeopathy is helpful to stop the further progress of the disease. Homeopathy is strongly recommended in the initial stages of Lichen Planopilaris wherein we can help to control the further progress of the disease. 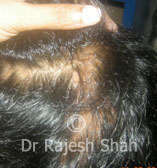 It is not possible to grow hair on the scalp which has scarred skin. Good control of further deterioration is also considered as significant treatment using homeopathy. Frontal fibrosing alopecia is thought to be a limited form of Lichen Planopilaris. Pseudopelade is also known as alopecia cicatrisata.